stock (like ours) or of French stock by looking for leg feathers. carcass than that of traditional American meat breeds. is not so hot if you’re raising the chickens just for their eggs. color is important to you, be sure to look for a dark-laying strain. than rotating, so they might have had limited access to good food. whether the reports are true. 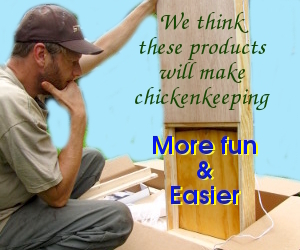 is the perfect way to keep your chickens healthy and happy. Be sure to give an update on broodieness scores for all your breeds this spring and summer. I’m trying to decide on a dual purpose broody chicken breed. Thanks! I will definitely keep you updated (and I hope you’ll do the same with your potentially broody breeds.) So far, nobody has been interested in sitting on the nest, but it’s a bit early from a hen’s point of view. Any broody hens yet this spring? Dave — The hens we had that went broody were all Australorps (and none of them stuck with it.) But our Cuckoo Marans are younger — maybe they will go broody next spring after they’ve had some laying under their belts? I have only one Cuckoo Marans,Bea. She is just over a year old and her chicks are 5 weeks old today. I really didn’t want her to go broody and tried to break her but she was too determined so I gave in. She has been a great mother and successfully hatched every egg I put under her. I hope yours have the same tendencies as my Bea. Sarah — Sounds like we need to swap birds! No broody Cuckoo Marans here yet…. Our cuckoo never went broody so we gave away her fertilized eggs to a friend’s broody Orpington who hatched 5 out of 6 eggs. Our little Silkies will annoyingly brood over a rock if it’s under them. You might consider a Silkie to hatch any fertilized eggs and she’ll mother ducks if that’s what hatches. We gave away our large cuckoo because she started brutalizing our two little Silkies while our Leghorn remains sweet and polite with the little ones. Sylvester017 — I’ve been very disappointed in our marans’ (complete lack of) broodiness too. On the other hand, the hybrid australorp x marans broilers seem to grow faster than either parent, so that’s a plus! We may have to try silkies. I’ve heard from several folks who’ve had the same great luck with them as mother hens that you have. I have 2 Cuckoo marans and they are very skittish and are the only 2 of my flock that don’t squat for me. We love their eggs (large) one is a nice medium dark brown and the other is tan with dark brown speckles. They matured a lot later than my other chickens too, 5 1/2 to 6 months old before they started laying.